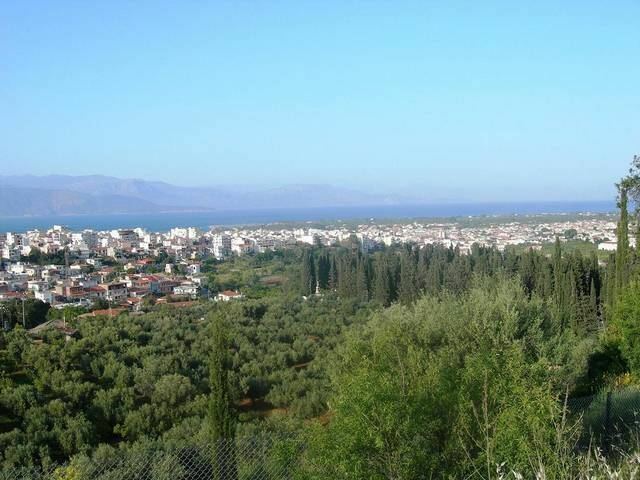 Aigio, also written as Aeghion, Aegion, Aegio, Egio, (Greek: Αίγιο, [ˈeʝo]) is a town and a former municipality in Achaea, West Greece, Greece. Since the 2011 local government reform it is part of the municipality Aigialeia, of which it is the seat and a municipal unit. The municipal unit has an area of 151.101 km2. Its population is around 26,000. 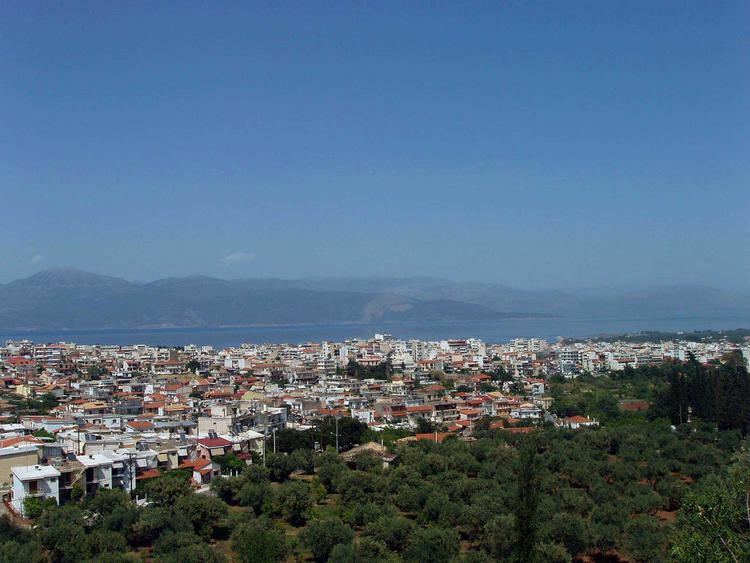 Aigio is a port town on the Gulf of Corinth. The southwestern part of the municipality consists of the foothills of the Panachaiko mountain. The river Selinountas flows into the Gulf of Corinth in Valimitika, 5 km east of Aigio town centre. The town centre is immediately on the coast, between the ferry port and the railway station. Fishermen bring their catches from a night of fishing into the markets every morning. Sites of interest include a Mycenean house dating back to ancient times, located near the cliffs. There is a hospital southwest of the town centre. Residential houses surround the city and flourish in the western part of Aigio, making it a popular destination for Athenians and others alike. Orange and lemon trees grow in most yards, and irrigation from small, open canals keeps the city greener than most. Before the founding of the city, the area had a Neolithic settlement. The city of Aigion was founded during Homeric times and became part of the first Achaean League since around 800 BC. The city had several Olympic winners including Xenophon, Ladas (stadion race), Athenodorus (Αθηνόδωρος) (stadion race), Straton (Στράτων) (pancration and wrestling). After the disaster of Helike, which was destroyed by an earthquake and buried by a tsunami in 373 BC, Aigion took the territory of the neighbouring city. The ruins of Helike (sometimes called "The Lost Atlantis") were discovered in 2000 off the coast in the Corinthian Gulf and archeologists are excavating the site. From 330 BC Aigion was for fifty years under the Kingdom of Macedon, but around the year 275 BC the people expelled the Macedonian garrison and the city joined the new Achaean League. With the famous temple of Zeus Homarios, Aigion became the Achaean assembly place and remained their capital until the Roman conquest in 146 BC. After the annexation of Achaia, the Romans removed the wall of the city and Aegium lost its importance. After the division of the Roman Empire in 395 AD, Aegium became a part of the Eastern Roman Empire and later the Byzantine Empire. After the Slavic invasions of the 7th century it was renamed Vostitsa (Βοστίτσα). The origin of this name is the Old Church Slavonic word vosta or vostan which meant the city of gardens or the garden city. It was captured by the Crusaders in the early 13th century and became the seat of a barony of the Principality of Achaea. In the early 15th century, it was conquered by the Despotate of the Morea, and in 1459 was conquered by the Ottoman Empire, who ruled it, with brief interruptions by the Venetians from 1463 until 1470 and from 1685 until 1715, until the outbreak of the Greek War of Independence. It was captured by the Greek rebels on 26 March 1821, becoming the first town to be liberated. After Greek Independence, the town was officially renamed to its ancient name. On June 15, 1995, a serious earthquake destroyed many buildings and damaged roads in the downtown and southwestern sections, with a number of casualties. The earthquake shattered Aigio: small memorials are found throughout the city, with candles aglow day and night to remember the victims. The mountainous countryside near Aigio was severely damaged by the 2007 Greek forest fires. One of the most notable attractions of Aigio is the church of Panagia Tripiti. It is a national sacred shrine dedicated to the Mother of God the Life Giving Spring. It is built on a steep cliff almost 30 meters high, near to sea, in a beautiful landscape full of cypresses and pine trees. The church of Panagia Faneromeni which is the cathedral of Aigio and it is the work of architect Ernst Ziller. The interior is decorated with paintings of Constantine Fanelis. The Archaeological Museum of Aigio which originally housed the municipal market of Aigio.It is a work of the famous architect Ernst Ziller and it was built in 1890. Until May 2011 there used to be a ferry service from the port of Aigio to the north-eastern mainland city of Agios Nikolaos (not to be confused with the Cretan city of the same name). Ferry service was very small and only had three Ferries daily. The trip was 45 minutes long. The shipping company that operated the ferry boat announced on May 2011 the stop of the ferry service due to financial reasons. 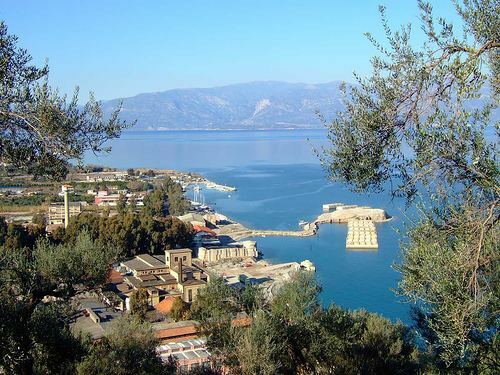 The port is crossed by rail which is not in operation anymore since OSE announced the suspension of all the rail service in the Peloponnese on January 2011. The city can be accessed by Greek National Road 8A (Patras - Corinth) and Greek National Road 31 (Aigio - Kalavryta). Aigio, along with Patras and Piraeus, was one of the main export hubs for Corinthian raisins since the 19th century. Today the port is used as a fruit import hub for Chiquita Brands International mainly for import of bananas. A new 256 m long pier northwest of the existing port was inaugurated on 7 August 2013. The whole project cost 8.6 million Euros and is intended to enhance trade and tourism opportunities for the city. Aigio houses two branch departments of the Technological Educational Institute of Patras, the department of Physiotherapy and the Optics and Optometry department. The General Hospital of Aigio is situated a few kilometres out of the town and has a capacity of 100 beds.The Hospital performs the greatest number of Laparoscopic surgeries in Greece while more than 50,000 people are examined on a yearly basis.